These are rough years for the Chicago Cubs organization, committed to a complete rebuild which means losing seasons and a lot of them. Every once in a while comes a big moment like a 17-5 explosion against the St. Louis Cardinals with Junior Lake standing out with his home run and the numbers of runners he helped score. This was the most the Cubs have scored against their division rivals in almost 40 years. They finished with 20 hits on 45 at bats and really brought the hurt to starting pitcher Tyler Lyons, allowing nine hits and nine runs before walking off, and woke up again with Randy Choate being on the receiving end, not lasting a full inning while giving up 7 hits and six runs in the ninth. Junior Lake stood out among the horde of hits coming from Cubs bats. He finished with his fourth home run of the season coming in the 2nd inning, right after Mike Olt hit his 8th of the season. Lake finished with 6 RBIs on the day, as his two doubles both helped two runners score while his home run was a three-run homer. 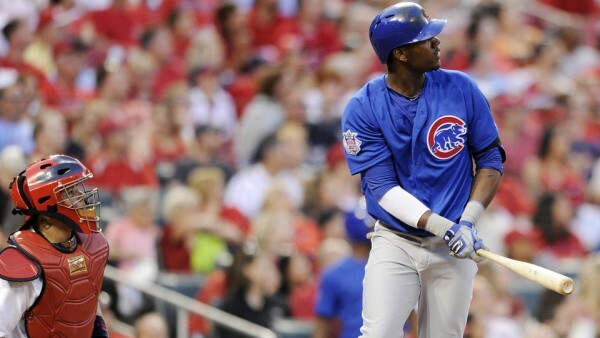 Olt’s homer was a two-run homer, scoring Starlin Castro, who was on base for an RBI triple. This was an excellent hitting game for the excellent shortstop. Not just the triple, but finishing with 3-of-6 at the plate and 3 RBIs. Emilion Bonifacio didn’t get RBIs, but he did end up with four hits and a walk, reaching home plate each time thanks to the support of those coming after him. Anthony Rizzo also had 3 RBIs, getting all three of them on a sac fly and grounding out. Even starting pitcher Travis Wood, picking up the win (3-4) got a hit and reached home plate on an almost perfect day. The Cards didn’t do well when hitting, but almost every time they connected a run came out of it. Most of their points came in the 5th inning, as Matt Holliday, Allen Craig and Yadier Molina got RBIs off of Wood. Brian Schlitter, Justin Grimm and Hector Rondo came on after him for an inning each, allowing just one hit and striking out just one batter between the three. Wood has a 4.91 ERA following the game, although his bad cutter didn’t hurt him and Cubs too badly this time. Lyons now goes down in history of the rivalry as the first Cardinals pitcher to give up nine earned runs against the Cubs since Bill Sherdel on June 29, 1929, a player who was later traded. Lyons is 0-3 with a 6.12 ERA in six starts this season, as the Cardinals fall to 19-20 on the opening game of the series. The Cubs are now 13-24, hoping that this win can help spark some sort of momentum to carry them out of the NL’s cellar.